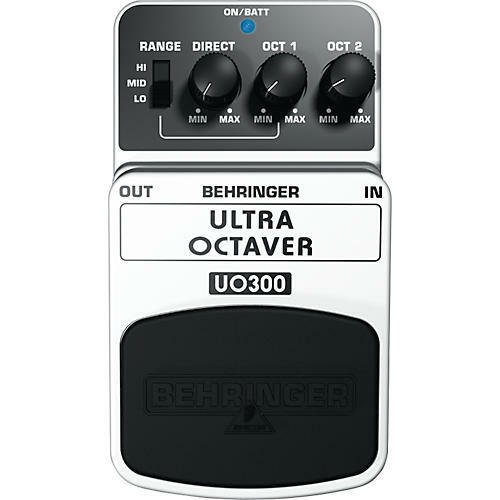 The Behringer Ultra Octaver UO300 underpins your sound with added muscle, generating notes one and two octaves below what you play. The result is powerful, with deep, rich impact that is only possible when guitar and bass lines are joined at the hip. First, use the dedicated Range control to specify whether you want to add beef to the high, middle or low frequencies, then dial in the amount of your original sound with the Direct knob. Lastly, turn up the Oct1 and Oct2 controls to add the lower octaves. The UO300 isn't just great for fattening up guitar riffs--it'll add incredible beef to keyboards and bass too! The status LED tells you when the UO300 stomp box is working its magic, and the excellent on/off switch maintains superior signal integrity in bypass mode.